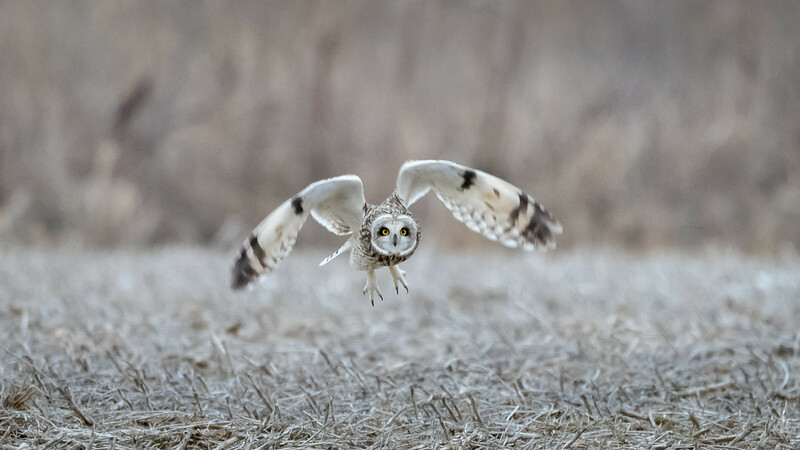 I got out last evening, locally, with a couple friends, and photographed some short ear owls in some local corn fields. The temperature was in the mid-20' F, and the breeze was a moderate 5-8 mph, it was heavy overcast, and low contrast. 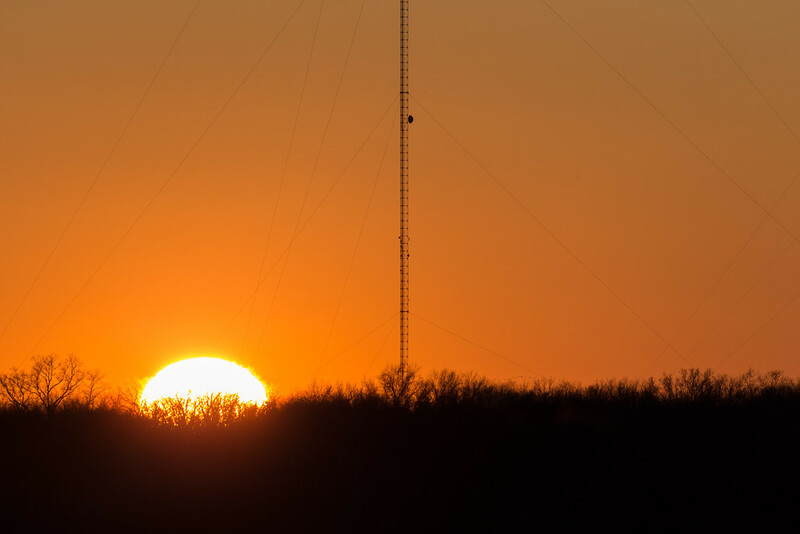 My shutter speed I set at 1/800th ( far too long for good bif's ) but with my aperture wide open at f5.6 -6.3 my ISOs fell to around ~ ISO 6400, or a bit higher or lower as the sun approached the horizon a few minutes before sunset. The sun was setting hidden behind the overcast. I mention this because the low, flat light made AF slow and variable, even on my 1DX Mk II. 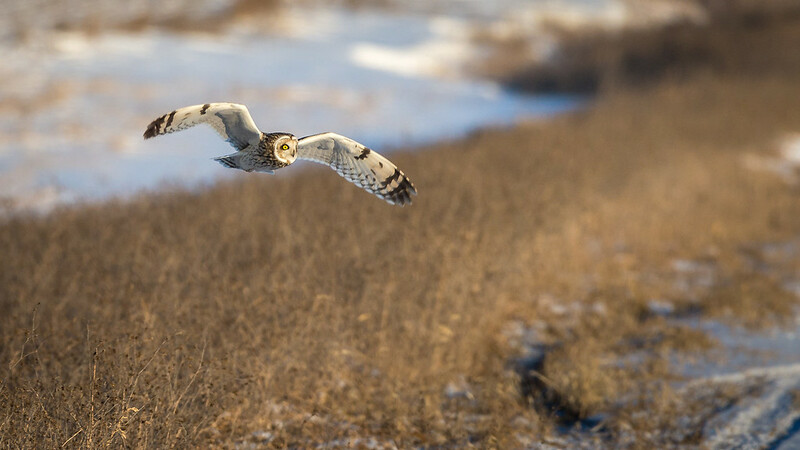 Owl flight patterns can be highly variable and it can be hard to follow them with long lenses. These were all shot hand held. I was not prone for the last image, although it almost looks like it, doesn't it? Comments, criticisms, and suggestions are heartily entertained! I like these! My favorite is the first image. Is this an area where you can often find owls? 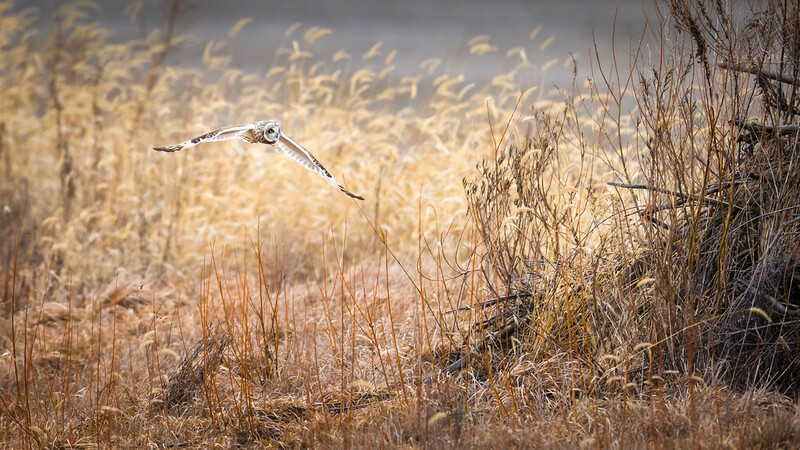 I saw my first snowy owl last week, owls are such amazing birds! This is the first time I’ve photographed owls here, so I don’t know if the owls are present year round, or just in winter. 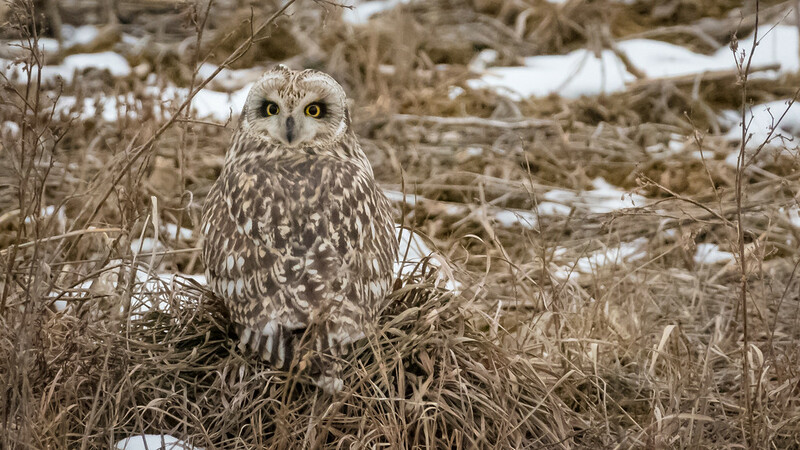 My iBird app shows short eared owls present all across North America, but Indiana may represent a winter range. The terrain last night here in central Indiana, barren cornfields, resembled the area around Barrie, Ontario where I photographed snowy owls last January with Juan Pons and Kevin Pepper. There was a lot more snow in Barrie, though... And a layer of snow just makes everything look so much prettier. Love that first image as well. That deserves to be printed Large. The owls were certainly wary of you and the camera. Another vote for 1. Jim - more appealing wing angle (imo) than 2 ... altho 2 has lost one of a couple of (very) minor eyepulls present in the first frame.... circular light blob frame L and the slightly darker bit of bg above the bird's RH wing, frame 1 ... both easily dealt with if one felt the need. On the relatively few occasions I've tried shooting SEOs I've also tried a lower pov ... not on the ground, obviously - but aligned cam just above the hunting ground vegetation ... this offered several pros (for me) ... losing hand of man stuff in distance, guaranteed different shots from everyone standing ... and more clearance between bird and veg tops (closer to its eye level). Such a (lower) position might well have provided a cleaner silhouette for the bird's RH wing in 1, rather than the almost tangential intersection currently present with 'horizon'? Btw, with one exception (unexpected barn owl appearance at waterfowl venue) - so gear on post with bean bag - all other tries have been with gear on tripod (+video head) ... but HHolding a 500 f4 isn't fun imo. Paul, I am pleased you posted. I do agree that the white blob and the darker bits could be cloned out, although I wasn't offended by them until you pointed them out. I need to study my images more carefully I think. Kathy and I went back out a couple days later, and caught a few more images. This time my best images were with a 400mm prime. Faster optics do seem to help when you are shooting near/after sunset on very overcast days and the subjects are fairly distant, typically greater than 40-50 meters. I described the terrain as cropland, but it really is reclaimed strip mining land that is being tilled, but still has a fair amount of brush along the edges of the field, and fairly deep ditches with some ice or standing water, depending on temperature. Good area for hunting by avian predators. Sometimes the birds hunt each other too. 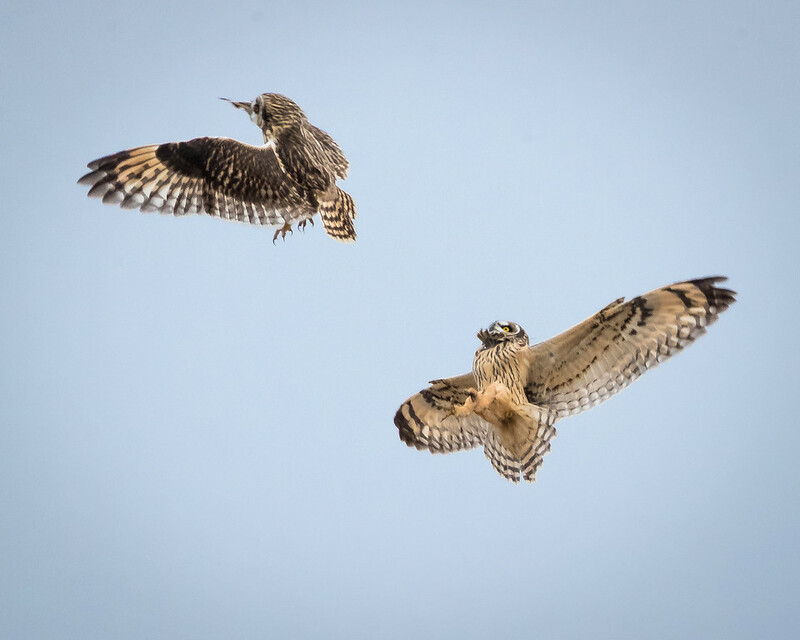 We got to see a spectacular aerial battle between an owl and a hawk, which I was unable to capture. 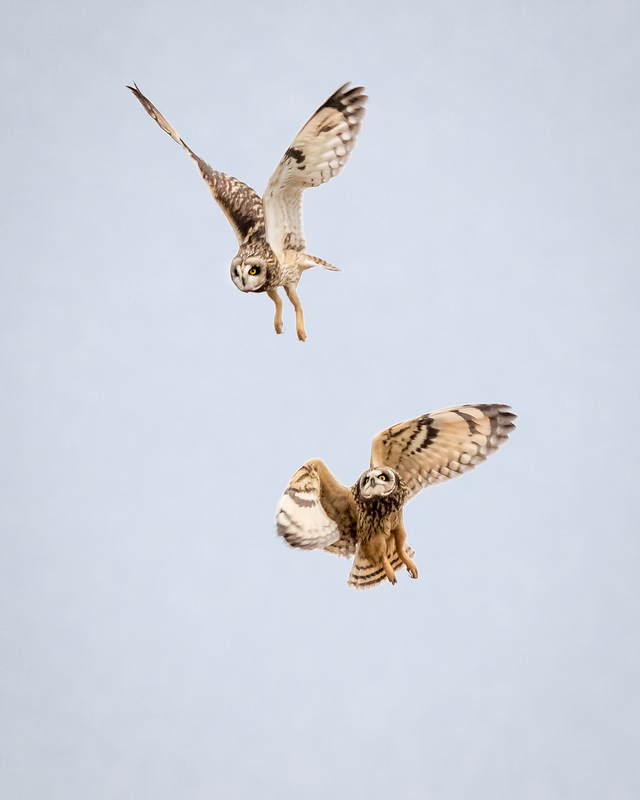 But I did grab several frames of two short ear owls fighting in mid-air. Very challenging to follow as they were really blasting around, up and down, like their life depended on it. And they may have. Comments and criticisms heartily encourage, and listened to. I did shoot these standing up, not kneeling or prone, but I was standing in about three inches of very cold, soft, grey mud, so I do ask some forbearance. Nice clean bg (and fg) on the second shot ... and such would normally get my vote (fwiw) ... but I find the head angle / gaze direction something of a disconnect ... compared with shot one. I do also wonder if much would be lost with a tad sliced off the top (in 2) to remove the couple of darker blobs top left of frame ... and accentuate the pano shape ... which I think works well with these subjects. On this visit, I think I prefer 1 for the sense of environment over subject detail ... altho I'd be tempted to mess around with the frame shape a little and lop off a bit of the darker material frame right - as its dark mass acts as something of an eye pull (to me, anyway). I found the comment about circumstances interesting too, as it reminded me of similar experiences in the past ... one of the advantages imo of returning to the same venue ... for me was taking additional kit to allow me to continue on subsequent visits in less than ideal circumstances. We went back a third time, yesterday - the first day we've seen real sunlight in about two weeks. It was a joy to have more light, and I shortened my shutter speed to 1/1250th but I have decided that is still too long for these birds when they are flitting about - they are really fast, especially when in aerial combat with each other. 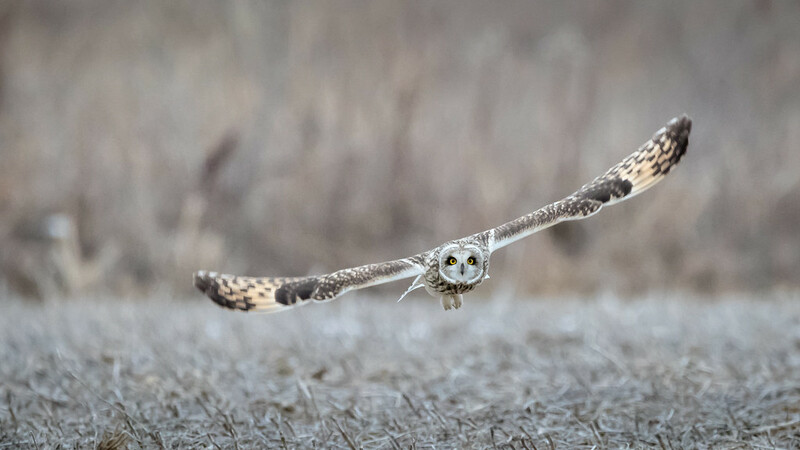 When I shot snowy owls we used 1/3200th for shutter speed, and I think I need to approach that with these short ear owls when they are very active. The can be really fast in the air. I agree with Paul that the first two images in my most recent post can be cropped in various ways, but I posted what I thought was my preference - I do agree that the shrubbery on the right in the first image is a bit strong, but I wanted to let viewers see what the terrain was really like and I thought that frame was good for that. 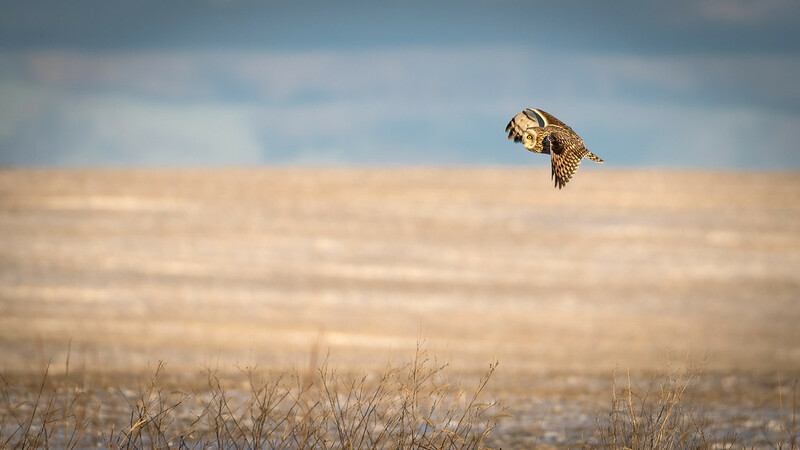 The head position in the second image may be a bit unique, but one thing I really noticed culling from thousands of images shot of short eared owls over the last couple weeks, is that their head is REALLY quite mobile while they are in flight. I have countless images of them flying by me tangentially, while their head is turned and they are staring directly at me. Their head is at least 90 degrees from their axis of motion. Eagles do this, of course, but not to the extent I have seen with the owls. It really is quite interesting to see. I also have lots of images of them flying low over the ground with their head turned strongly down so they can closely look at the sound surface, while they are cruising along over it in flight. And to show how late in the day we were shooting ---- It can make the colors look unnaturally saturated when editing some of these frames. 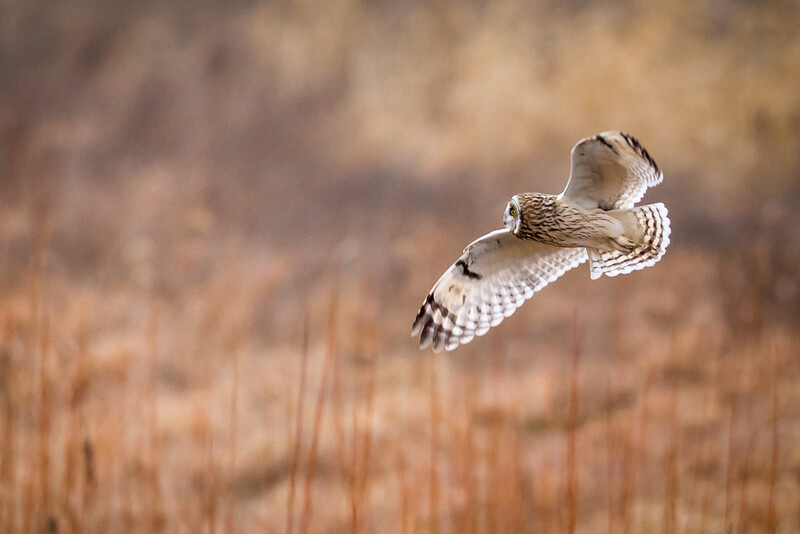 The light on the owl is fantastic, the surrounding grass frames it beautifully.